Since the Way to Go! 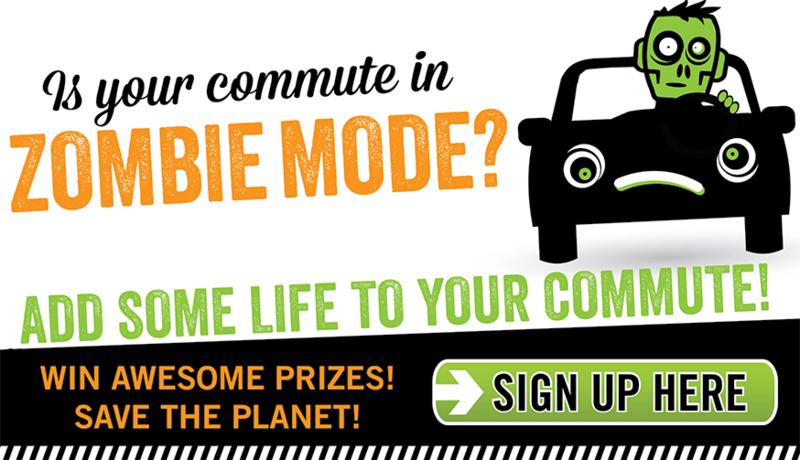 spring challenge, maybe you’ve slipped back into your old one-car-per-driver commuting ways? Way to Go! is hoping this message finds you before it’s too late! We’re here to warn you about an epidemic sweeping the region: Commuter Zombification. Among the most common are a vacant expression, brainless spending, and really bad gas (emissions). Can’t recall how you got to work this morning? Could be another confirmed case of Commuter Zombieism. Just in time, Way to Go! is pleased to announce the cure: add some life to your commute! Walk, bike, carpool, carshare or take the bus during the fall Way To Go! week taking place October 14-18. Join other businesses, schools, and organizations to make a big difference. Help stop 250,000 lbs of carbon pollution in one week! You can make it happen. And you might score an iPad mini, Bash Badge ski pass, or some great outdoor gear! Zombies hate prizes. October 14-18: it’s Go Time.